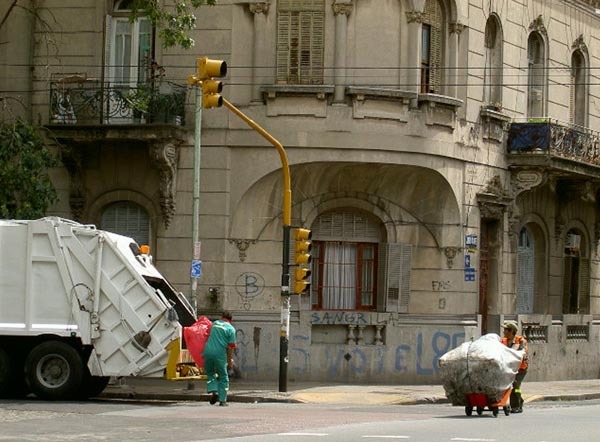 Argentina is about to industrialise the process of waste-disposal treatment. The problem of waste disposal is being tackled ambitiously, and the aim is 0% waste in 2017! In March Caro Isern, Iris de Kievith and Jan Jongert organised the ‘reciclan’ workshop. Together with Argentinean designers and waste specialists, they looked for ways to turn common local waste products into building materials. Before the final workshop day we are invited by local energy company Edenor for a quick visit to a poor neighbourhood of Buenos Aires where they work with Iduar, an independent institute that has been engaged in urban development and social housing for a number of years. We see a row of people outside the Iduar offices. Every day two hundred people apply for housing repairs or a new house. Mortgages are available for new three-room homes measuring 43 m2. People without resources can buy their own house for twenty dollars a month. But at fifty years, the repayment period is rather lengthy. Edenor has now started a pilot project to finance the renovation of a neighbourhood of twenty dwellings in which, in contrast to the model dwelling, energy efficiency will be a factor. Residents receive a new fridge and home improvements in exchange for their help in registering savings so that the findings can be used in subsequent projects. What is the importance of a low energy bill to an energy company? When a customer cant pay the bill, its the energy companys problem. It can cut off the energy supply but theres a big chance energy will simply be tapped from the neighbours, certainly considering that the dwellings are entirely self-built. And thats no doubt why the system of bailiffs doesnt exist here. In these houses we can see how the energy bill can be reduced considerably with little effort. The concrete floor and stone walls are damp and cold because there are no insulating layers and waterproof foils under the floor. Moisture from cooking remains in the room because there is no outlet above the stove. The lack of fenestration means the moisture cannot escape and means that the light is on all day. And the TV is also on, but thats another matter. On our way to these houses we passed factories where the flow of refuse can be charted, an example of organisational skill from Recyclicity that impresses people here. The waste products from these factories could certainly be used to develop better building materials than are possible with the ordinary domestic rubbish we studied in the workshop. In addition, climate and orientation to the sun and wind can be exploited much better. Together with the project manager from Edenor we discuss possibilities of applying our ideas with Arcagrup and testing them in practice, where the need is so great. We structure the workshop in the Dutch manner. We prepared a matrix diagram with the different building elements on one side and the selected domestic refuse materials on the other side. The matrix should stimulate everybody to generate as many applications with the materials as possible (Day 1). Out of these results we want to select three or four applications that we can develop further and test (Day 2). On the final day we hope to make prototypes of these. Despite our strict pre-selection of maximum 20 participants, no fewer than 40 arrive on the first day to take part. They include students, architects, industrial designers and older professors. 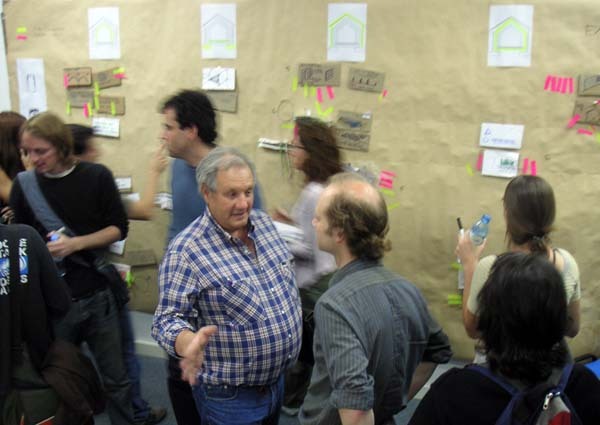 Around twenty concepts are discussed in four groups (isolation, construction, cladding and foundations). All participants are given red and yellow stickers to indicate what they think are beautiful and/or feasible applications. Six applications prove popular. With these applications in mind, participants experiment with the materials to work out the feasibility of the required processing. In the meantime, the group has grown to 50. Refuse architect Carlos Levinton offers a critical appraisal of all ideas at the end of the day. On the final day work focuses on the three most feasible ideas: the Tetrapak panel, the PET-bottle floor and the cardboard-block wall. Spirits are high as thirty people work out all possible applications. As always, everything is ready in the nick of time to be presented to a small crowd. 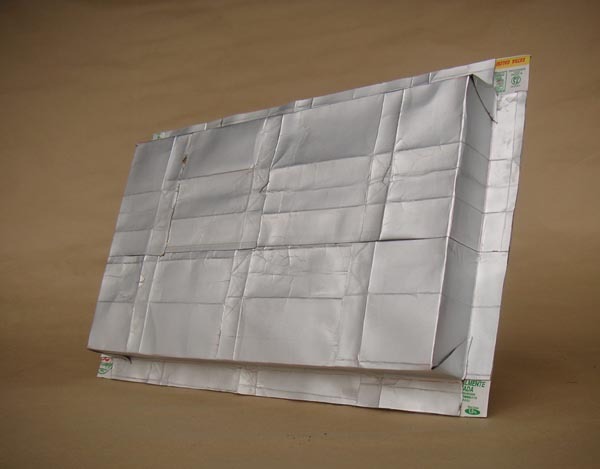 The Tetrapak panel is an insulating wall panel measuring 40 by 60 cm. It is made of honeycomb cardboard packed in drink cartons that have been folded flat and ironed together. In that way they provide heat and light insulation. The protruding flaps allow the panels to be ironed together. Tools needed: knife, sewing machine, glue, iron, baking paper. The PET-bottle floor provides an insulated, dry floor that can float when the water level rises. The PET-bottles are placed on the ground and connected to one another between lid and nozzle with polyethylene foil. Reinforcement is placed on top and then the floor is poured. The floor (without the concrete) is tested to 1200 kg/m2. Sticks can be inserted into the bottles to increase the bearing capacity of the floor. Tools needed: hands, concrete mixer. 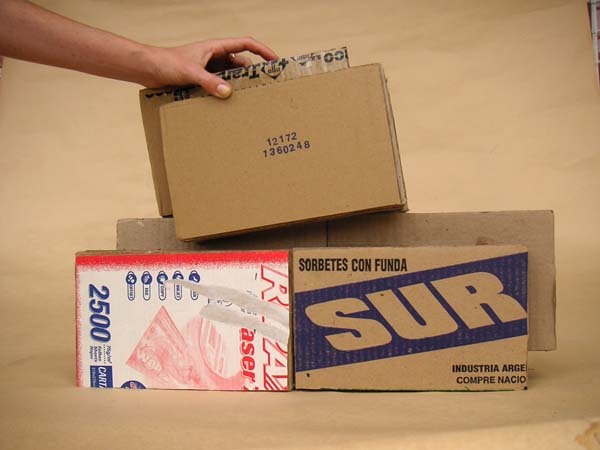 The cardboard-block wall is a simple building system made of sheets of cardboard up to 10 cm in thickness and glued together. The blocks are shaped in such a way that they slot together like pieces of Lego. They make it possible to build light partition walls or dividing walls that thermally isolate. Tools needed: knife, glue. This evening is the first public meeting in which Jan sits alongside a representative from the municipal refuse collector Ceamse, a representative from the Ministry of Environment, Greenpeace, and the local refuse architect and our host Carlos Levinton. 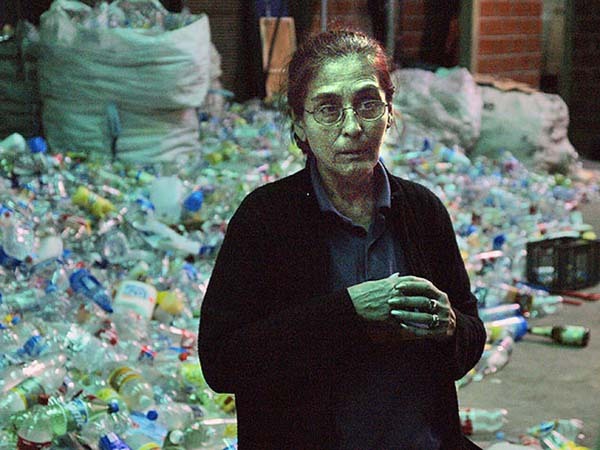 In Argentina, where most refuse in still dumped, refuse policy is only now being formulated. Partly owing to the low labour costs, this makes it possible to set up not only central recycling processing plants but also local recycling networks that can help in the development of a more balanced and energy efficient system and lead to more energy efficient housing for residents. The workshop over the coming days will hopefully help start this process. One could of course say that theres far less money available in Argentina than in the Netherlands. 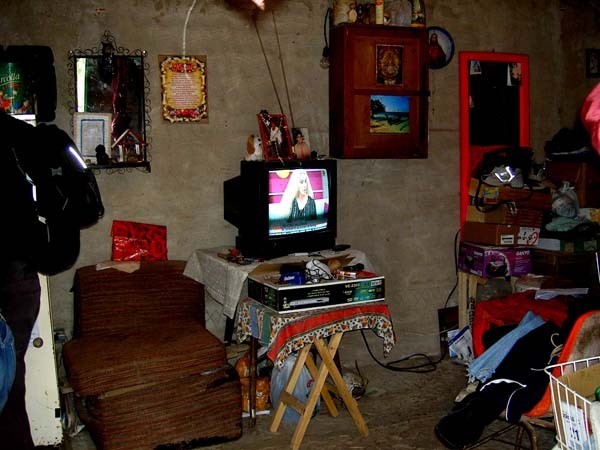 The average Argentinian person pays 3 euro a year in refuse tax, while a Dutch person pays an average of 400 euro. The 3 euro may not sound like much, except when you consider that the refuse is just dumped on an open refuse belt in the city. Greenpeace knows what has to change; the manufacturers of packing materials much be held accountable by law. People have to recognise that refuse is a problem that has to be tackled. Money could even be saved by collecting domestic refuse more efficiently, and that money could be used to limit the damaging effects of rubbish tips. On our way to our hotel we see refuse collectors at work. Its an impressive sight, like watching long-distance runners. Muscled men run behind the truck and throw rubbish bag into the truck from all sides. Nothing wrong with the efficiency of these men. Our workshop takes place in the afternoon and early evening (till 10 p.m.) so that people can attend lectures or work before and after the event (!). Sometimes we think that far less work would need to be done if there was a plan and if everybody knew about it. Thats one of those cultural differences that prompted Caro, whos part Argentinian and part Dutch, to benefit from the merits of the two by setting up a cooperative. We in turn get acquainted with a society unfamiliar with the notion that time is money. People here make time for each other in an appealingly warm way. 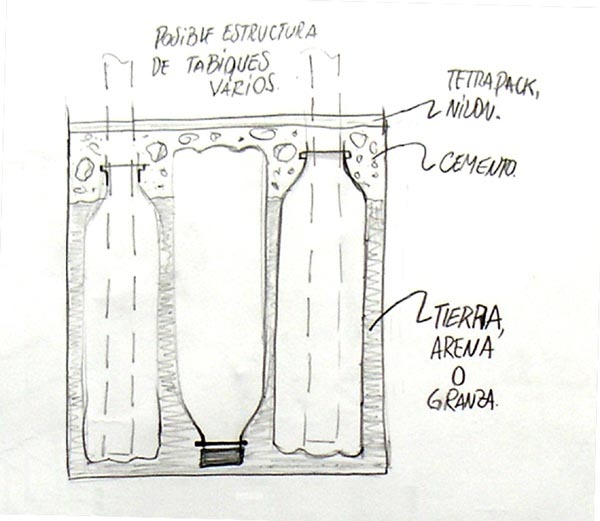 Cristina Lescano, founder of El Ceibo, explains the difference between different PET bottles. The majority of them are now shipped to China to be processed in to fleece. Today a visit to El Ceibo, one of the best-run cooperatives of cartoneros. Around 40 workers are sure of a minimum wage, which is rare in this informal line of trade. Thanks to enthusiastic campaigns, almost 1000 households in the neighbourhood take part in the project by separating their domestic rubbish and thereby supplying clean refuse. The people from El Ceibo can collect this during normal working hours. Wearing recognisable uniforms, they are called the VIPs among the cartoneros. The organisation uses a big shed provided by the government but lacking electricity. Its a waste disposal plant in its infancy where everything is separated by hand. Huge sacks of PET bottles, cardboard, tins and other packing material are sold from here to the recycling industry. In our workshop we want to study how this material can be reused as building material. We visited El Ceibo to find out about the price of refuse material so that we can estimate what the production costs of reuse will be. In addition, since many of the workers live in difficult circumstances, the organisation offers an opportunity of finding out what building materials are needed locally. On our free Sunday we visit the district of La Boca, known for its idyllic houses and honoured in many tangos. The houses were originally made of corrugated sheets used as ballast in empty ships from Europe. Poor Italian immigrants built their houses with them and painted the houses in bright colours. It became such a cheerful sight that the district is now a tourist attraction with shops selling knickknacks. Its a successful recycling project. The neighbourhood is swamped with hooligans and riot police as a big football game takes place at the nearby stadium. The atmosphere gets a little too heated for our liking, since its Boca versus River (comparable to Ajax versus Feijenoord). This has been the third in our series entitled ending up by chance in particularly massive gatherings in just three days. We head to the national library by Testa  a fantastically ridiculous building in a similar spirit to our auditorium in Delft  where by chance a classical concert is about to begin. Turbulent times in Buenos Aires. Just a week ago the president decided that March 24 is a national day of remembrance to commemorate the military coup in 1976. By law, all civil servants enjoy a free day; hospital operations and marriage ceremonies are put off at the last minute. 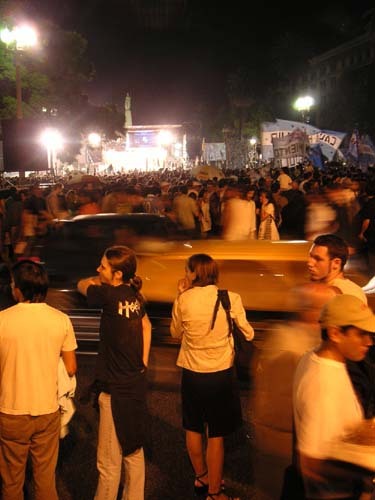 The evening before the commemoration day there is a massive demonstration on Plaza de Mayo, the square in front of the presidential palace where the Mothers of the Disappeared still gather every week to demand justice. Hordes of flag-waving demonstrators stream towards the square, and traders selling drinks and Che Guevara flags do brisk business. 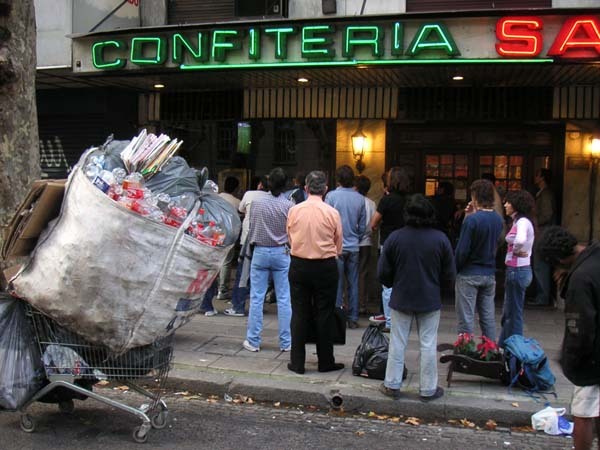 We also see the first cartonero, people rooting cartons and PET-bottles out of bins and taking them away in a trolley. The Faculty of Architecture and Design at the University of Buenos Aires (UBA), where the workshop is being held, is plastered with posters in honour of students and staff missing since the years of dictatorship and in protest against current government repression. Various actions and general strikes are planned this week. This university, which provides (too little) space for 36,000 students, was built during the period of dictatorship at a safe distance from the city, close to the airport. Lectures and talks are constantly interrupted by the deafening sound of low-flying aircraft. Add to that the fact that the new academic year brings ten thousand new students swarming through the building, and theres chaos everywhere. Re-sample is an Argentinian-Dutch collaborative project organised by Caro Isern (Atelier Caro Isern) and Iris de Kievith (In Situ Architecten) in collaboration with the foundation Recyclicity (Jan Jongert) and Arcagrup (Carlos Levinton). The project is made possible thanks to support from Hivos (Humanist Institute for Cooperation with Developing Countries) and the Netherlands Fund for Architecture.